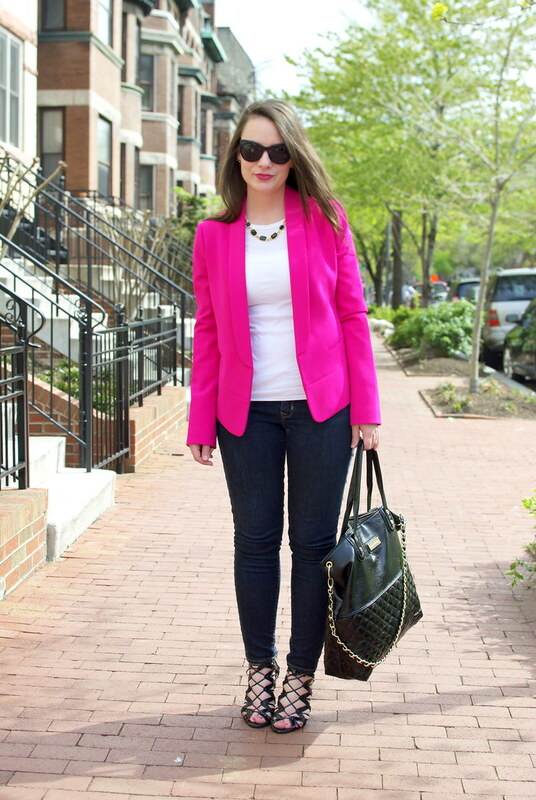 The deets: Express blazer; GAP jeans; J.Crew tee; Target x Prabal shoes; Steve Madden bag; Elizabeth and James sunnies; Anne Klein necklace; Kate Spade earrings; Lancome "Midnight Rose" lipstick. All photos c/o the lovely Natalie of The Fashionably Broke. This happens to be what I wore to my blogger bestie brunch on Sunday. I think I have recently discovered that my "signature style" (or the type of outfit I feel most like myself in) is mostly neutral with a zing of bright color and some fab shoes thrown in for good measure (also seen here, here and here). That's officially my recipe for looking and feeling good, feel free to try it out and report back with your tweaks. After I made this realization I became much better at shopping with intent and putting together looks on the go. What's your signature look? I'd love to know! I always find it SO hard to describe my style or signature look. I definitely think this is yours though! 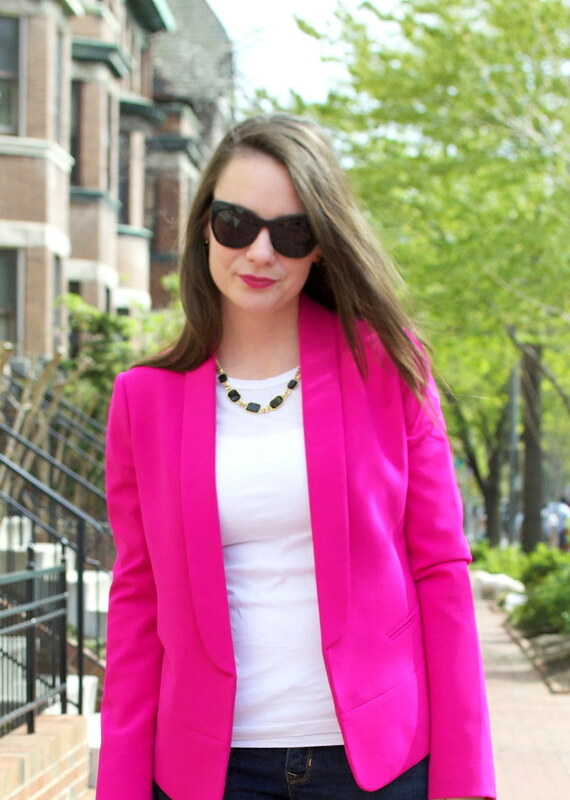 I love the shape of that blazer and the pop of color it brings! 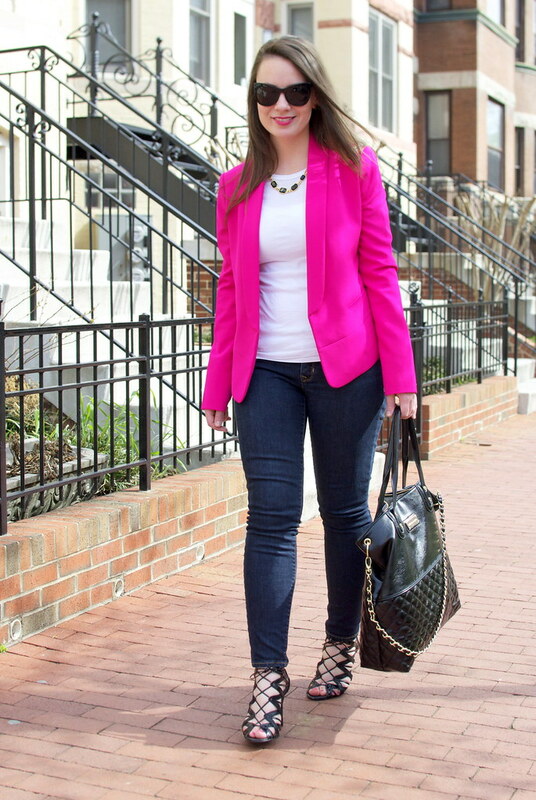 I love love love this outfit, Erin - that blazer! swoon! I feel like I'm slowly but surely making my way towards a signature style–although I still can't describe it accurately. You look gorgeous! Great blazer! And your signature style ain't too shabby either! I like the IDEA of having a signature style, but...I don't think I have one. I just wear what I like :) But if this is your signature style, it's definitely working for you! Erin, you look great! I LOVE that blazer. I've been on the hunt for my own bright pink one. I'm with sarahsreallife above...I love the idea of a signature style but am not sure I have one. It's only been a couple of years since I started actually caring about fashion so I think I'm still trying to find what's most "me." I feel like it's easier for me to figure out what isn't me than what is. Guess I'll have to keep looking! 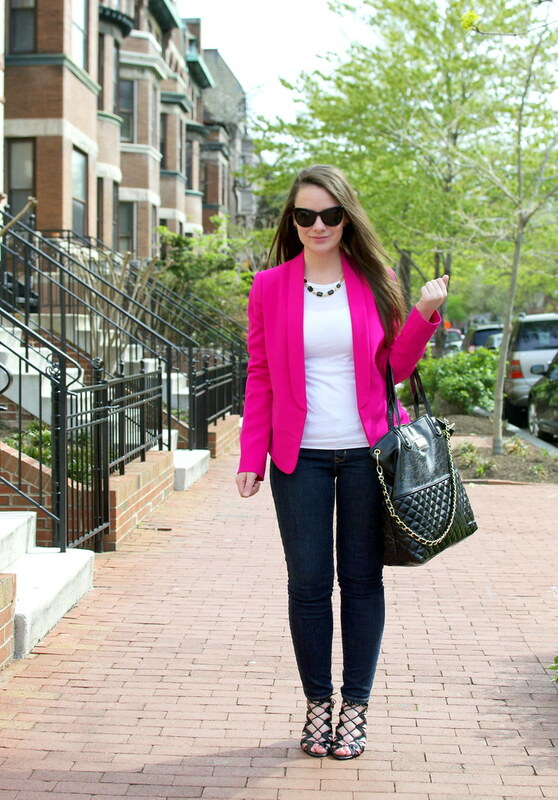 I am loving your pink blazer! So pretty and those shoes are fabulous. 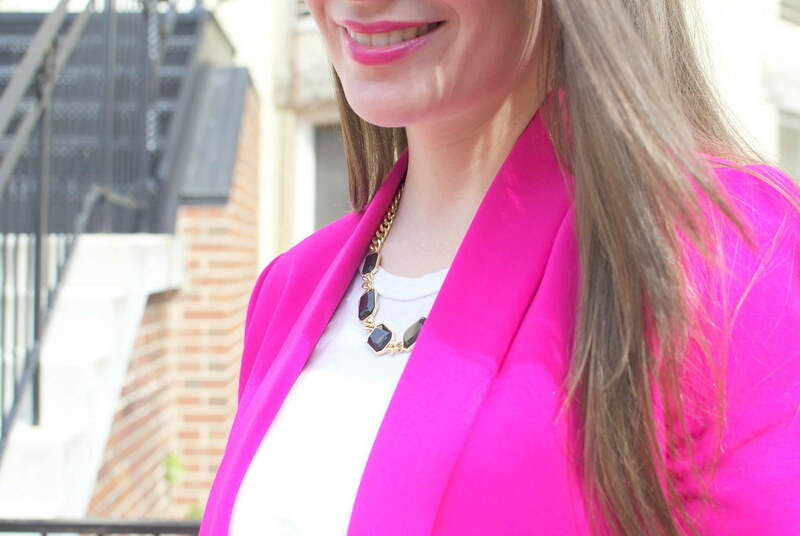 Blazer color looks eye candy, love your look. You look stunning doll! Adore your shoes.